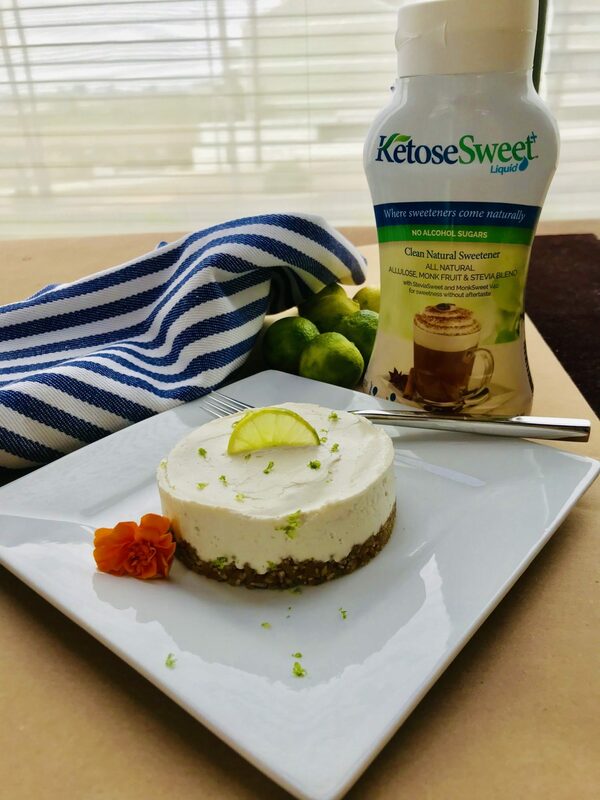 Key lime pie and cheesecake just got together and had a love child… I used KetoseSweet to naturally sweeten the cheesecake and it turned out beautifully. It uses monk fruit and stevia and is a fraction of the calories of sugar with no aftertaste. Cut apricots in half lengthwise with kitchen shears, then widthwise three times, making six pieces. This will make them mix more readily in your food processor. Place six 3-inch diameter ring molds on a cookie sheet with parchment paper underneath. If you do not have ring molds, use paper muffin cups that are 3-inches in diameter and 2 inches high. Evenly distribute the crust into each of the six molds, placing about 2.5 T. of crust mixture into the bottom of the mold and pressing it firmly to cover the bottom area of the mold or muffin cup all the way to the side. Pour the cheesecake mixture into the molds and evenly distribute. Place the cookie sheet with the cheesecakes in the freezer for 60-90 minutes until firm. Remove cheesecakes and let sit on counter for ten minutes to soften up – if you leave them out too long, they will revert to their liquid form. Place each cheesecake on a plate and garnish with a thin slice of key lime and lime zest. Serve immediately.